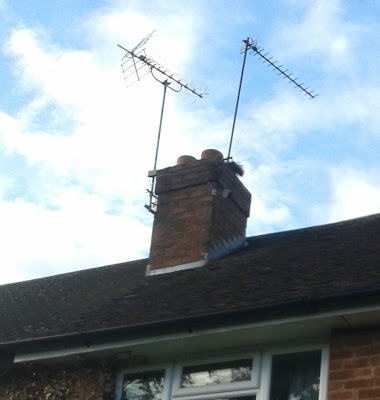 All of my working life has been spent on building sites and working in peoples houses. Even though I'm a carpenter I've worked with a lot of painters and over that time I've picked up loads of tips that make things fast, easier and give a better finish. So I thought I'd share a few of them here with you guys. I was always told that painting is 80% prep. I know it's boring to fill and sand walls and woodwork but the time spent before painting pays off on the finish you'll get at the end. Buy some caulk. Any black lines between skirting and walls or architrave and walls always scream that an amature has done it. Run a line of caulk across the top and smooth it over with your finger so there be no gaps in your painting. On fresh plaster save paint by rolling everything with a mist coat first. his is 50-50 water and paint. It seals the plasterwork and means you use a lot less paint on your first coat - also when you put this coat on the wall it's easier to see any defects and fill them. Buy a pole for your roller! This has to be the most important tip on here! I hate seeing people up close to the ceiling rolling a 2ft square patch before moving the ladder and repeating it. The pole means you can cover a huge area without moving much and save your back (it also gives a more even finish). Use the pole on the walls and ceiling and you'll see how much easier it is. Buy good quality paint. It covers better and gives a better finish. Sometimes it can mean the difference between 2 or 3 coats, then it doesn't seem so cheap anymore. Bag it up - If you've got to do another coat of paint the next night don't wash your roller up. Just place it inside two plastic bags and wrap tightly around it. It should keep for a couple of weeks or more like this without drying, the same goes for brushes. You can only do this with water based paints though! Thats just a few tips to start with - if you want more DIY tips let me know, I've hundreds! Or if you've got any of your own put them below! Yesterday once I stained the oak floor and had a clear up I managed to have half an hour in the garden. Some of the leaves on the squash plants have started to die back so I decide to collect up the ones with hard stalks and looked ripe. I was a little disappointed as there wasn't as many as I thought there might be. For so many leaves, taking up so much space, many of squash weren't that big. I know that it might be the variety but on tope of this a complete row of butternuts had failed to produce a single veg that I could harvest. Still there's enough here to keep us feed on Sunday roasts and soups through some of the winter and I'm sure there are some more under the leaves waiting to be found! 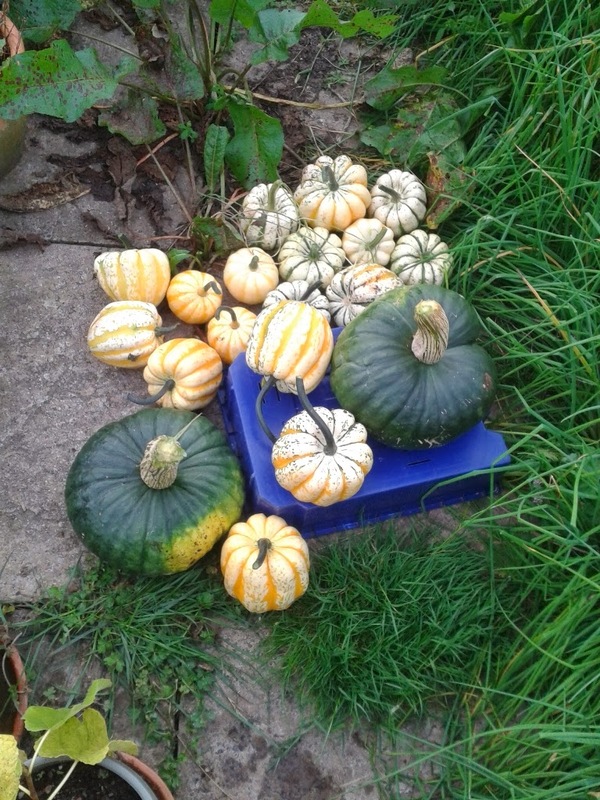 How has everyone elses squash harvest been? Last night at about 11 o'clock I think I crashed! I did some painting, got the floor filled and ready for sanding but that was as much as I could do, my energy levels were too low! An hour a day seems to have gone out of the window at the moment! I had to do the wimps thing today and not go to work (the one advantage of being self employed). This was so I could sand and stain the floor ready for adding the top two coats of oil tonight. Unfortunately the coat of stain hasn't gone off yet (hence why I'm on my blog) this means to get two coats on tomorrow I've got to get up very early, say four o'clock, as it takes two hours to get a coat on and I need to leave for work by half six. I might seem a little grumpy tomorrow! This last week has involved some late nights and a very tired Kev. The end is in sight though. I managed to get the ceilings finished painted, some more plastering done (in the hallway this time). 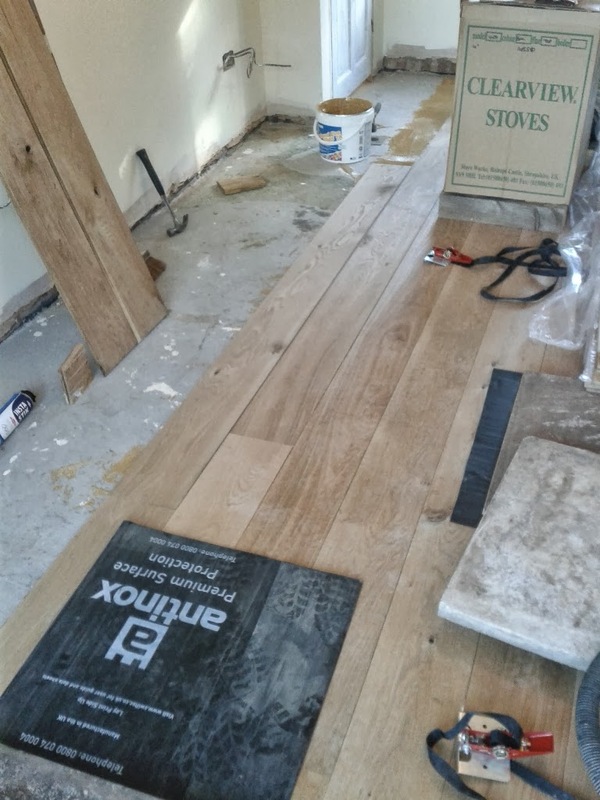 The slate slabs cut and laid for the fireplace (these look really good now I've sealed them) and this weekend one of my best mates, Andy, came over to help me lay the oak floor. He is, in fact, the guy that trained me to be a carpenter. We worked together for 5 years whilst I learnt the ability to earn a living from my hands. We had a great time working together and when I set off to work on my own he even sent me divorce papers through, as we used to joke that we spent far more time together than either of us did with our wives. I owe this man so much and yet he's always still helping me. 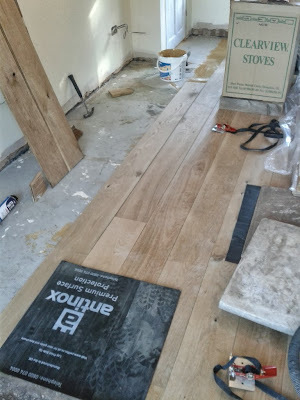 Unfortunately we didn't manage to finish putting the floor down as we run out of adhesive but I should get the rest down tomorrow night, as well as the step by the patio door. I'm aiming to have it all finished by the weekend but that means this week I've got to stain the floor, clear oil it at least twice, fit all the skirting and architrave, fill it, paint it, get the bricks round the chimney rendered, paint the "feature wall", fit the stove, curtain poles, sockets connected - there still seems to be plenty to go at! Hopefully I'll be back doing more smallholder type post soon and catching up on every ones blogs! It's been a while since I've done an update on the living room renovation. Over the last month I've managed to add some more sockets, remove the wall lights, change the light switch from one side of the door to the other, fit a new lining and rehang the door the other way round. 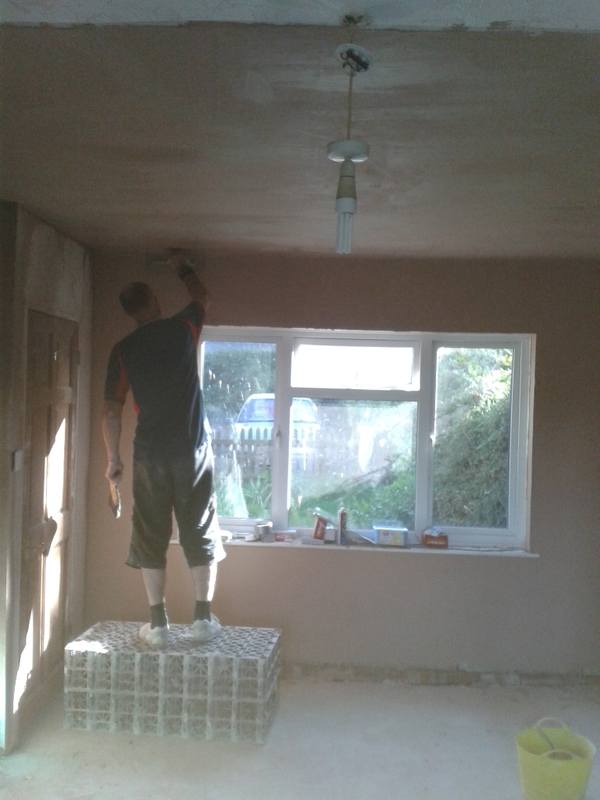 I then prepared the whole room for being plastered and got my good friend, Sean, in to plaster it for me. 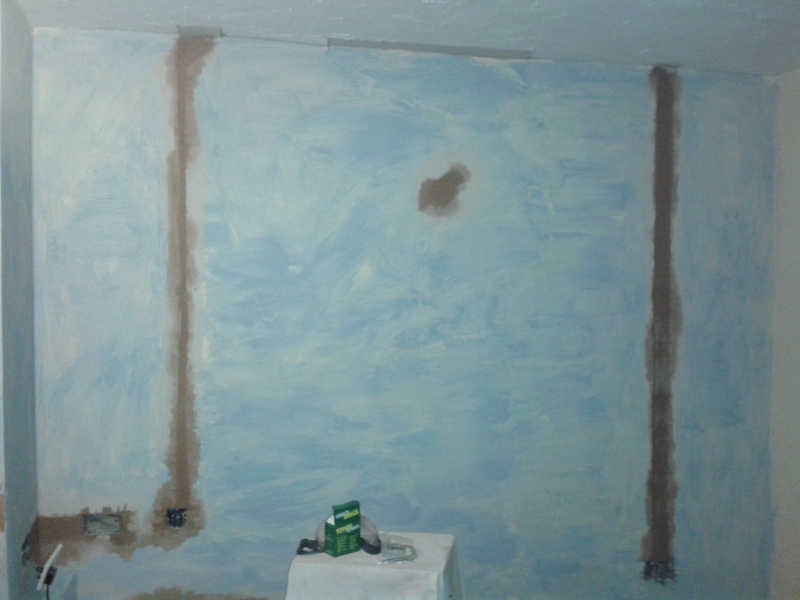 This involved painting the walls with a grit and adding some plasterboard back on the ceilings were I'd made holes to get the wires in. I've added a lintel over the fire place and then cast a concrete slab to cap it off, I filled void above with bricks. I've given the whole room one coat of paint and applied some levelling compound to the floor. 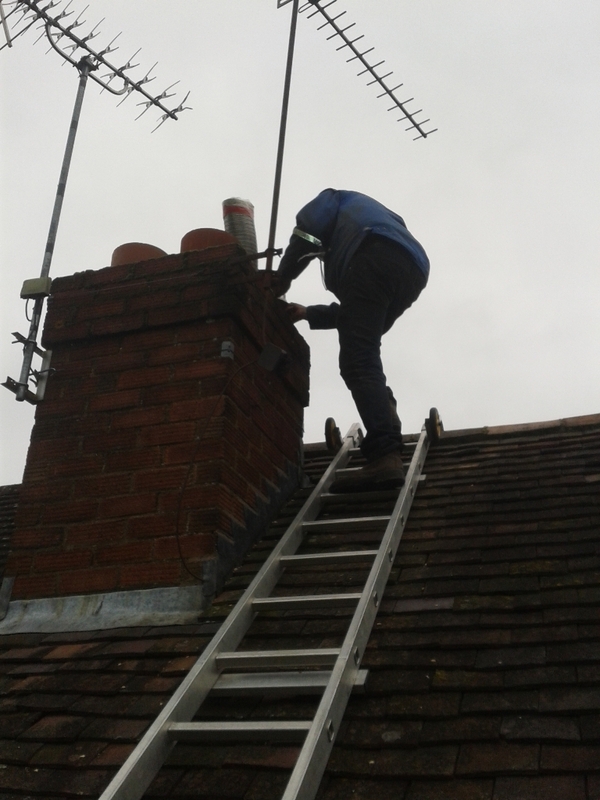 Dad on the roof - not a nice day for it! And to top it all off today we've been on the roof. I managed to rope my dad into helping line the chimney, so today we managed to get the liner in and insulated as well as repair a few broken tiles I had on the roof. Sorry I've not been blogging or commenting much the last could of weeks but hopefully when it's all finished you should be able to see why. The trouble is my deadline is coming up fast but there's no way of telling when he or she will be born - I just hope it's all done by then! 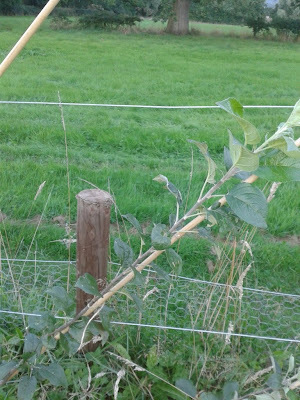 My apple trees have all grown well this year putting on loads of growth. 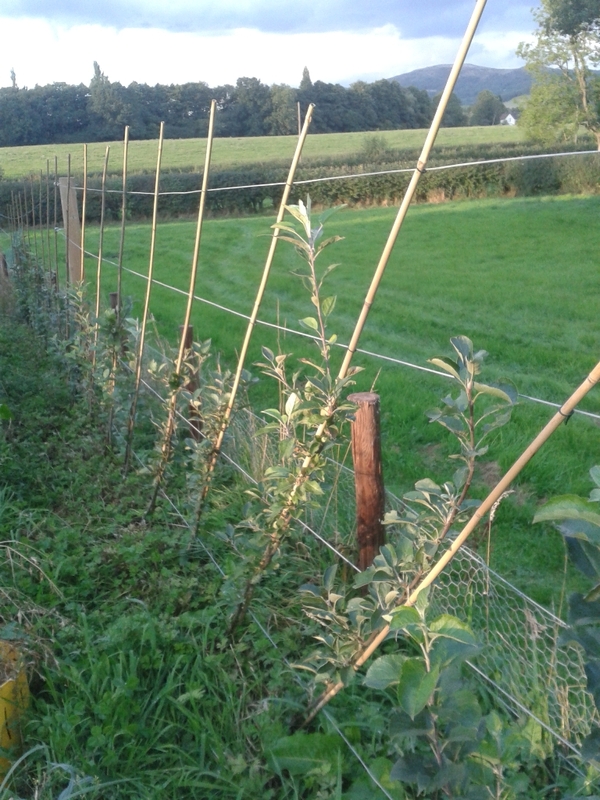 Today I managed to do a job I've been meaning to do for the last couple of weeks and thats to summer prune my cordon apple trees. They're meant to be summer pruned around two weeks before the apples are harvested off that tree, but as none of mine have got any apples on I decided to try to do it just late enough that they won't put any secondary growth on that will get killed by the frost. The first year of pruning these is quite easy. To start with I tied in the leader if it was growing vertrical and slackened off any ties that were getting too tight on the rest of the tree. I then cut any branch growth back to the lenght of about 1 1/2". These should for my fruiting spurs in years to come. 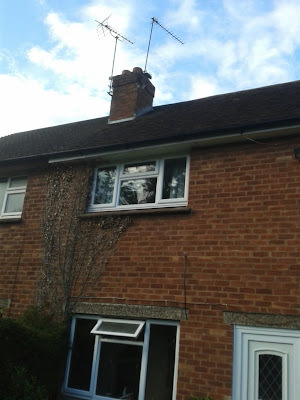 Although I did this for every tree, a couple of trees I left branches long so that I could take a graft off them in the spring to propergate from them. They all looked neat and tidy by the time I was finished. 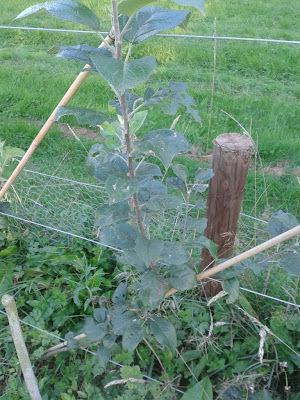 I am going to move one tree in the winter as it has far too many bare patches to be a good cordon and since planting it I have discovered it is a tip bearer so not much good as a tree that I'm trying to create fruiting spurs on. 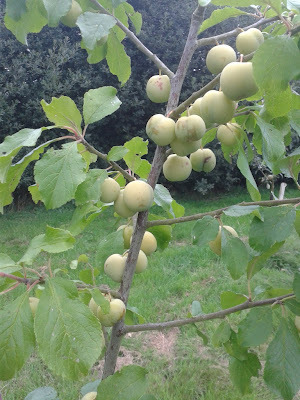 Anyone else summer prune their fruit trees? 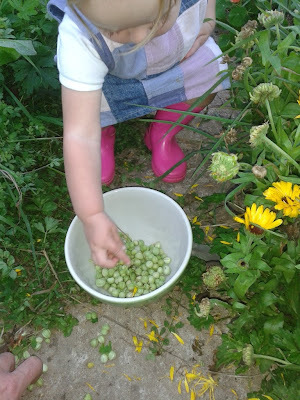 My little orchard isn't producing much fruit yet as most of the trees are only a year or so old. 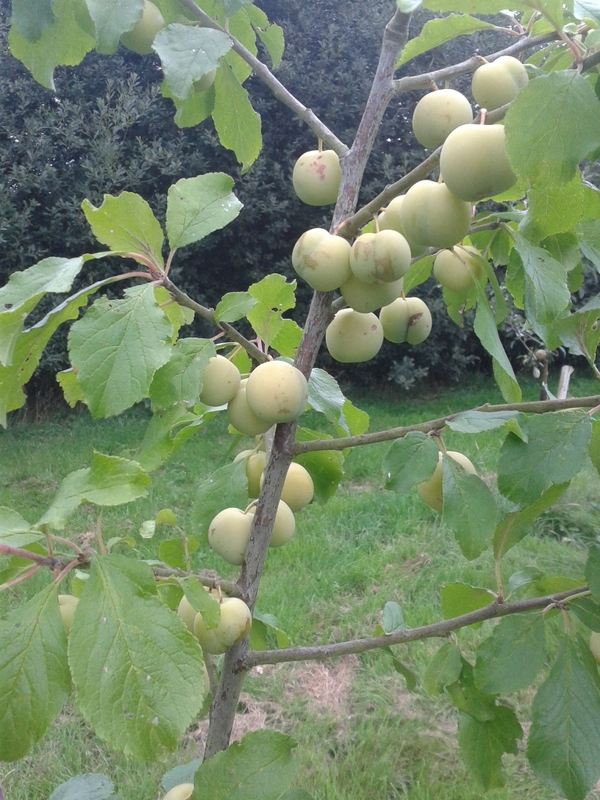 But the Early Transparent Gage I planted (it was a two year tree that I bought) has got loads of fruit on it. 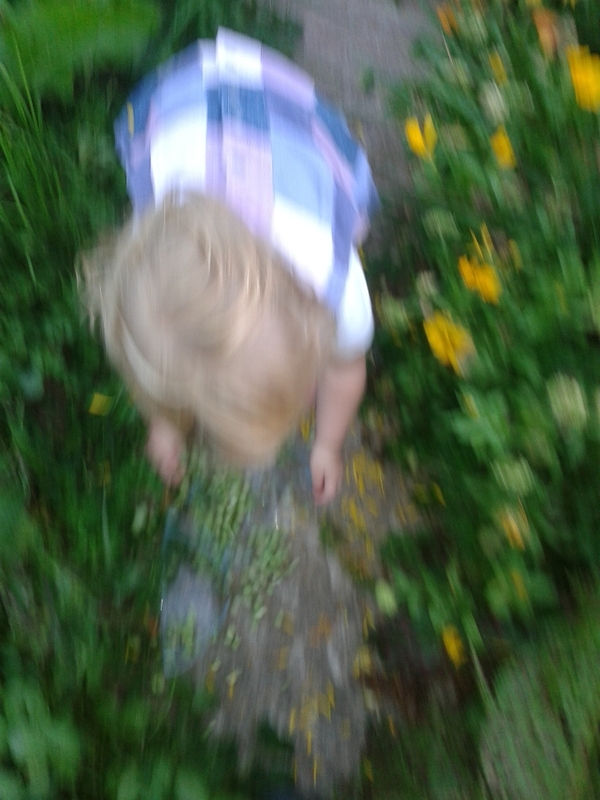 My little girl likes dragging me down to the orchard to go and pick one that we then share (I bite the stone out for her) also stopping by the raspberries on our way. I've never really had anything to do with gages before but if they all taste as good as this one then I'll be planting some more this winter. 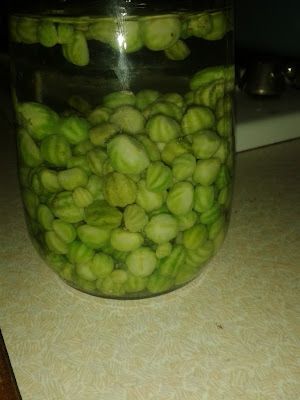 They look like they'd be great to bottle if I ever get round to learning how to do it. I'm still working at the same house I was last last year and I remember I commented on how nice the peaches were last August. This year there seems to be even more in their greenhouse, but many have bugs in and so many are just falling to the floor when they're ripe. 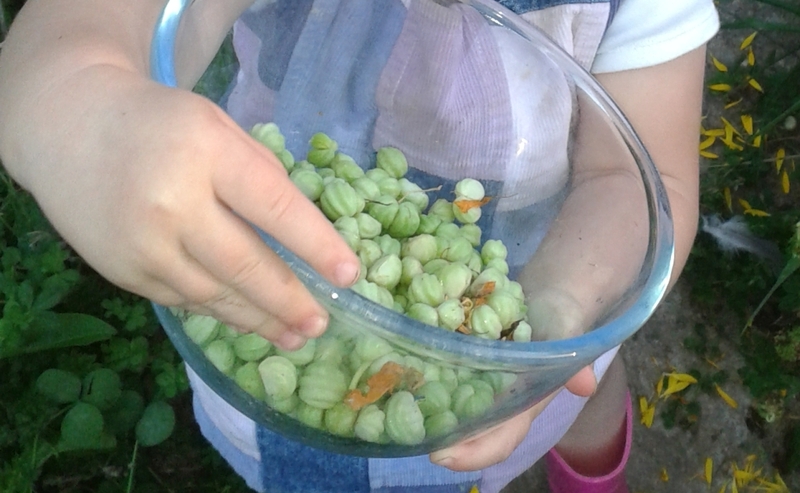 I decided to go and gather these up at the end of work on Thursday so I could try to make some peach jam. I've only ever tried it once in Thailand on our honeymoon and I remember it tasting pretty good! I had about 3lb of fruit by the time I took the stones out, cut away the bad and skinned them. Many were so ripe that the skins just fell away from the fruit. To this I added the same amount of sugar, the juice of a a lemon and an apple to help with the petin. I boiled it rapidly for 30 minutes until it reached setting point, which was quicker than I thought it would be as I'd no idea if it would set or not. The jam went a lovely golden colour and tastes very peachy (who'd of thought). I doubt I'll have many opportunities to make an English jam out of this semi exotic fruit. I think I'm going to have to build a wall just to have a peach tree growing against it now!